Israel , officially known as the State of Israel is a country in the Middle East, on the southeastern shore of the Mediterranean Sea and the northern shore of the Red Sea. It has land borders with Lebanon to the north, Syria to the northeast, Jordan on the east, respectively, and Egypt to the southwest. It contains geographically diverse features within its relatively small area. Israel's financial center and technology hub is Tel Aviv. Jerusalem is the proclaimed capital, although Israeli sovereignty over Jerusalem is internationally unrecognized. 18.06.2002 "Geology of the land of Israel" 28.08.2018 "Archeozoology in Eretz Israel"
[A1] On February 11, 2014 Post authority of Israel issued a set of 3 stamps "Makhtesh – Ancient Erosion Craters in Israel", one of these stamps shows Makhtesh Ramon. Makhtesh Ramon, located near Mitzpe Ramon, is the largest crater, up to 40 km long, 9 km wide, and 500 m deep. Makhtesh Ramon is a geologists paradise with fossils, rock formations and volcanic and magmatic phenomenon dating back as much as 220 million years. The Ramon crater began forming when the ocean that covered the desert began to move north. 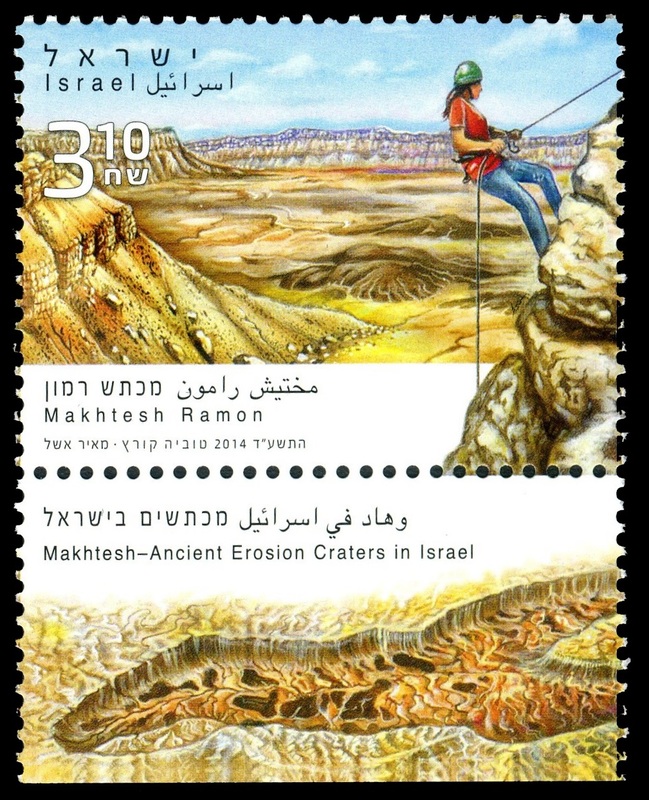 The geological map of Makhtesh Ramon area illustrates the first day cover of "Geology of the land of Israel" stamps from 2002. It has been designated as a national geological park. Once many fossils such as ammonite, shark teeth and petrified wood are unearth in the north-eastern edge of the crater.Some of them are depicted on illustration of an FDC, although these have mainly been extracted so only smaller fossils can be found here today. 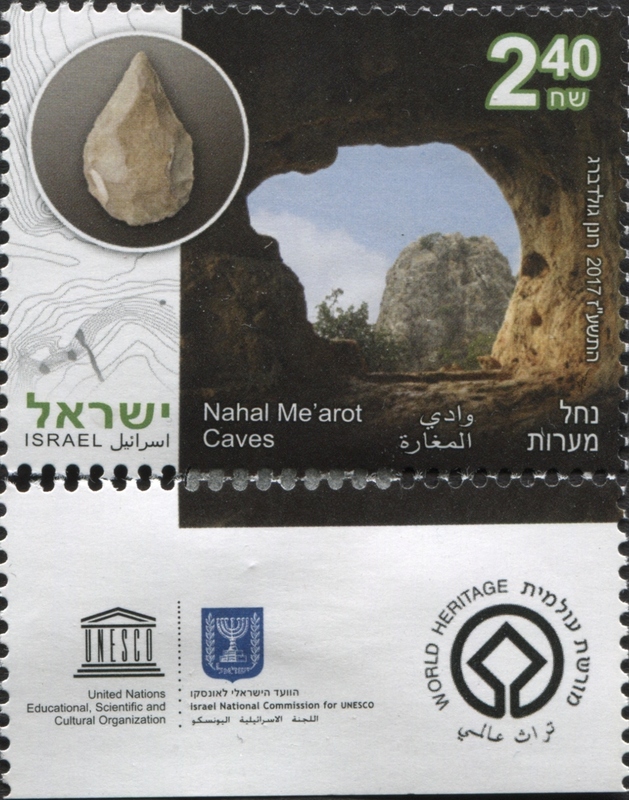 [A2] Three stamps showing UNESCO world heritage sites of Israel. One of them depicting a beautiful prehistoric stone tool from Nahal Mearot Caves in Israel. Four caves (Tabun, Gamal Nahal and Es-Skhul Cave) are carved into the mountain on the southern slope of Mount Carmel, at the entrance to the Nahal Me'arot Caves. Archeological excavations conducted at the site from 1928 to the present have discovered evidence of human existence near and inside the caves over hundreds of thousands of years. Among the many findings were remnants of houses, various stone tools, jewelry, bones of animals used for food and graves. 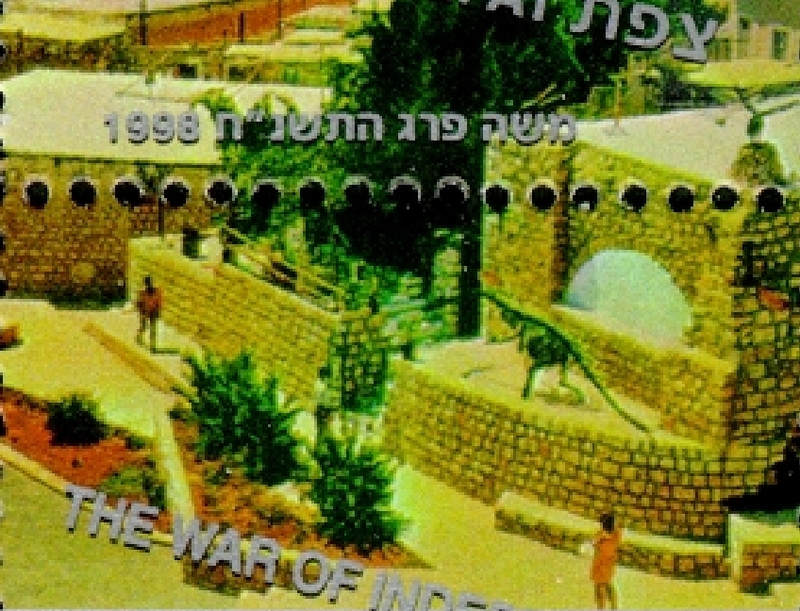 [NP1] In Februar 1998, post Authority of Israel issued set of three stamps "50-th Anniversary of independence War". The stamps issued in separate sheets and one common mini-sheet. These stamps represent the three battle fonts of Israel: the central front, represented by the battles at the Castel, on the outskirts of Jerusalem, between the 2nd and 9th of April 1948; the northern front, represented by the battle for Zefat and liberation of the Jewish quarter in Zefat in May 1948; the southern front represented by the raising of the Israeli flag in Eilat on March 10th, 1949, marking the termination of combat in the War of Independence. Every stamp shows some scenes from the battles on a top side and modern landscapes of the cities on the bottom . "Fossil" of Dinosaur shown on bottom right margin side of Zefat stamps. Zefat, sometime written as Tsfat or Sefat, is a small city with population of 30.000. Since the 16th century, Zefat has been considered one of Judaism's Four Holy Cities, along with Jerusalem, Hebron and Tiberias; since that time, the city has remained a center of Kabbalah, also known as Jewish mysticism. There are only few museums in the city, none of it is about natural history. In addition to its title as the city of Kabbalah, Safed is also known as a city of art. Many creative souls are attracted to and inspired by the winding, narrow, cobblestone streets of Safed's Old City, home to a bustling artists' quarter. Many small and middle size art galleries are located in the old-city. One gallery is belong to Arik Amir also known as "Arik the Animal Mimic" and "Arik the Sculptor", was born in Tel Aviv in 1922. In 1965 he purchased a ruined building in the artists' colony in the enchanted city of Zefat, which he renovated and called it "God's Little Acre". In the schools' summer vacation he commenced sculpting in iron, creating hundreds of sculptures. His home, "God's Little Acre" became a gallery with a permanent display of his works, and thousands of visitors from Israel and all over the world flocked to see it. In early 1980th he produced many modern and fantastic animal iron sculptures. One of the biggest sculptures he made is 8m high stylized dinosaur , which stood outside of his gallery and attracted both young and adult persons who came across. The iron-dinosaur appeared in newspaper and some postcards issued these time. Perhaps, the stamp designer used one of these cards as a source for his work. Unfortunately the dinosaur on the stamp is just an art object, not a fossil and not represent any real specie. Acknowledge: many thanks to Dr. Eli Moallem from Jerusalem, Israel, for his help to find some information about dinosaur on "50-th Anniversary of the War of Independence" stamps.